Note: These questions cover material from all parts of the novel, and so contain spoilers for those who haven’t read the book. In what ways is this book similar to a traditional fairy tale? In what ways is it different? 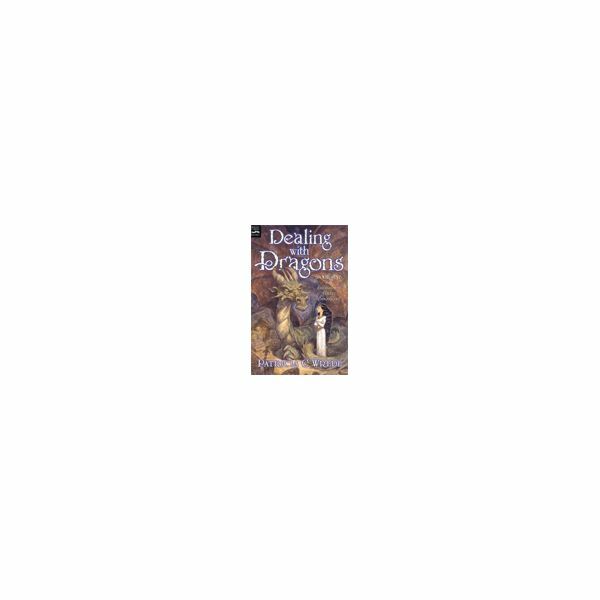 Dealing with Dragons pokes fun at a lot of ordinary fairy tales. It talks about typical fairy tale events as though they are everyday occurrences—like parents wanting their daughter to have a curse placed on her to make her a proper princess. Cimorene is very different from your average princess, and the dragons are not at all evil. At the same time, this novel still follows the format of a fairy tale, since it is about a character who must go on a quest to stop evil. A lot of magic is used, and there are talking frogs and genies in bottles and other mythical creatures. In short, this novel includes all the usual elements of a fairy tale but changes most of them, drawing attention to those changes. What one thing do people tell Cimorene over and over? Why is this phrase so important? Everyone is always telling Cimorene that what she does or wants to do “just isn’t done." This is repeated many times because it says a lot about her character and the book as a whole. Cimorene is a princess who doesn’t do things the way she should, who enjoys being different and trying new experiences. Also, the whole novel is based on things that just don’t happen in fairy tales, like princesses who do magic, dragons who drink tea and wizards who melt. How does Cimorene change throughout the book? In the end of the book Cimorene has learned to face her problems rather than avoiding them. She ran away from her parents in the beginning, but at the end is able to face up to and defeat the evil wizards. She is also more confident, and surer about who she is and what she wants to do with her life. In addition, in the beginning she mostly relies on herself but by the end she has learned the value of working with others and allowing them to help her out. In what ways is Alianora like the other ‘normal’ princesses? In what ways is she like Cimorene? Alianora’s personality is somewhere in between Cimorene’s and that of a typical princess. She enjoys wearing fancy clothes and crowns, and doesn’t mind sewing and learning about etiquette. Also, she has no problem with the idea of a prince rescuing her and is much more romantic and well spoken than Cimorene. However, she enjoys learning and doing new things, like Cimorene, and finds the other princesses rather boring. Alianora has always been considered different and lacking as a princess by her family, and she doesn’t mind being a dragon’s princess as much as the others do. She is also more clever than the typical princesses. What role does gender play in this novel? Cimorene is a princess but hates being one because she is forced to do ‘girly’ things like sew and dance all day. When she escapes to become Kazul’s princess, she is finally able to do more boyish things like read Latin and wield magic swords. She is happier, because she is able to do what she wants regardless of whether it is a masculine or feminine thing to do. Also, in most fairy tales the men rescue the women and are smarter and stronger, but the smartest characters in this novel are all female (including the dragon) and most of the men are not very bright. Here are some more open-ended questions for you to think about on your own. 1. What do you think is the most important lesson Cimorene learns? 2. Why do you think the author chose to write the book this way, instead of writing a traditional fairy tale? 3. How can we relate the themes in this book to our real, everyday lives?